Since it was established in 2002, Doga has been working to preserve birds and biodiversity with its thousands of members and volunteers. Doga is the partner of BirdLife International in Turkey, a partnership conservation organisations that strives to conserve birds, their habitats and global biodiversity in 121 countries. All people advocating the rights of nature may be a member or volunteer of Doga regardless of their language, religion, race or political opinion. For this reason, grassroots of Doga comprises a broad network of people including birdwatchers, students, villagers, researchers, artists, and activists. In 2004, Doga team played a major role for the development of the KBA methodology as part of an international working group and then published the “Key Biodiversity Areas in Turkey” book in 2006 being one of first KBA inventories in the world. The IUCN has further developed the KBA method and adopted it as a global standard for selection of sites for conservation, in 2016. Doga does not only identify and monitor KBAs, but also conducts numerous activities for saving these areas, particularly the IBAs in Danger, as a subset of KBAs. Main KBAs where Doga’s work delivered significant changes are Gediz Delta, Lake Burdur, Bosporus, Dicle Valley, Euphrates Valley, Urfa Steppes, Eastern Black Sea Mountains, Kızıldağ İzmir and Beypazarı Kirmir Valley. In 2004, Doga became a member of Alliance for Zero Extinction and subsequently implemented the Zero Extinction Campaign over two years. Extinctions of several globally or regionally threatened species are prevented as a result of this campaign. These include the Northern Bald Ibis, Goitered Gazelle, Striped Hyena, various restricted-range plants and freshwater fish. Doga developed a comprehensive conservation programme on monitoring and conservation of birds over the last 15 years. Several threatened species and large congregations of migratory birds are covered under this programme. Key species on which Doga is working are the globally threatened Sociable Lapwing, Northern Bald Ibis, White-headed Duck, Egyptian Vulture, Steppe Eagle, Imperial Eagle, Great Bustard along with regionally threatened species such as cranes and Fish Owl. Doga, since it is established in 2002, is working to enhance the birding community in Turkey and works closely with bird-watching groups and actively supports development of new groups. There were less than a hundred bird-watchers in Turkey when Doga is established, now, there are nearly 2000 people watching and photographing birds across all provinces actively contributing in bird conservation through citizen science. eKusBank is a key citizen science tool established by Doga in 2004 and allows birdwatchers from anywhere in Turkey to input and query bird observations. Since 2015, eKusBank is linked with the global eBird network and it is maintained in cooperation with Lab of Ornithology of Cornell University and Turkish Bird Records Committee. As a partner of BirdLife, Doga has partaken in several international projects. In 2010, Doga prepared the CEPF profile for the Mediterranean Basin Hotspot in cooperation with Conservation International team and BirdLife partners in the Mediterranean. A baseline inventory of two seabird species, Yelkouan Shearwater and Mediterranean Shag for identification of Marine IBAs along the southern Black Sea Coast is prepared in collaboration with Hellenic Ornithological Society (HOS), BSPB, Romanian Ornithological Society (SOR) from 2012 to 2014. Doga and BSPB works in alliance since 2015 not only to identify breeding territories of the Eastern Imperial Eagle and Egyptian Vulture in Turkey but also for their on the ground conservation. Better understanding and conservation of migratory flyways been among Doga’s spatial priorities since it is established. In 2017, Champions of the Flyway focused on Turkey’s flyways and supported Doga’s actions to mitigate impacts of collusion of and electrocution and illegal killing of migratory birds. In 2017, Doga joined organizations from thirteen countries in the Balkans, Middle East and Africa working on the endangered Egyptian Vulture aligned across the flyway of the species. 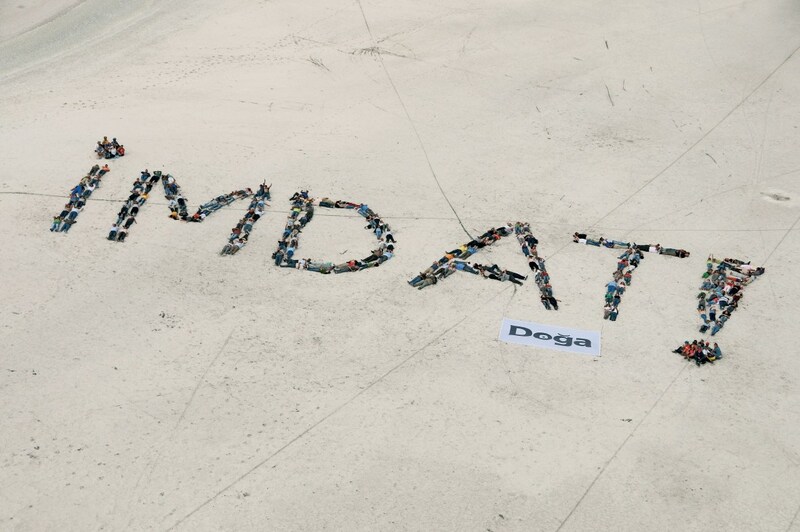 Doga implemented campaigns opposing major threats at two IBAs in Danger, which are the Gediz Delta and Dicle Valley, Hasankeyf. As a result of Doga’s campaigns, major construction projects at the Gediz Delta are stopped and the governments of Germany, Austria, and Switzerland withdrew their support to the Ilisu Dam, threatening the Dicle Valley, Hasankeyf IBA and KBA. Never before has an existing export guarantee been cancelled due to ecological, social or cultural concerns. Doğa’s demands gained strength with the support of over 100,000 people who signed up to the campaign’s petition, with an aim of inclusion of Hasankeyf in the list of UNESCO World Heritage Sites. Acclaimed authors and artists have also endorsed our campaign to save Hasankeyf and the Tigris Valley including Tarkan, Yaşar Kemal, Sezen Aksu, Orhan Pamuk and many others united under the international campaign of Doga. Many members of Doga has joined “The Great March of Anatolia” in 2011 and the “Gezi Movement” 2013 which is are of most influential civil movements in Turkey. Both initiatives achieved the cancellation of a draft law proposing suspensions of key nature conservation regulations in Turkey. In 2013, Doga founded the Nature School (Doğa Okulu) in Izmir, Aegean part of Turkey, in partnership with the Seferihisar Municipality and other allies. Doga’s Nature School works to develop innovative training programs for persistence of biodiversity and nature culture and serves for institutionalization of Doga’s know how. In 2015, Doga’s Shop, named Yavaş Dükkan, is founded with an aim of promoting healthy and local products that support sustenance of biodiversity particularly at IBAs and KBAs. Doga works for development of criteria for identification and conservation of Indigenous Production Landscapes as unique anthropogenic spaces to preserve biodiversity. Hands on conservation actions for such landscapes is carried out, primarily for the olive and oak pastures of the Aegean since 2016. Doga continues working across Turkey to preserve birds and biodiversity in cooperation with more than forty Local Conservation Groups. Doga’s headquarters are relocated from Ankara to Izmir in 2017.